Delivering $3,000 of donations to assist those who were affected by Typhoon Chaba. On October 27, UNIST visited the Ulju County Office to deliver $3,000 of donations to assist those who were affected by Typhoon Chaba, thought to be the strongest typhoon to hit South Korea. 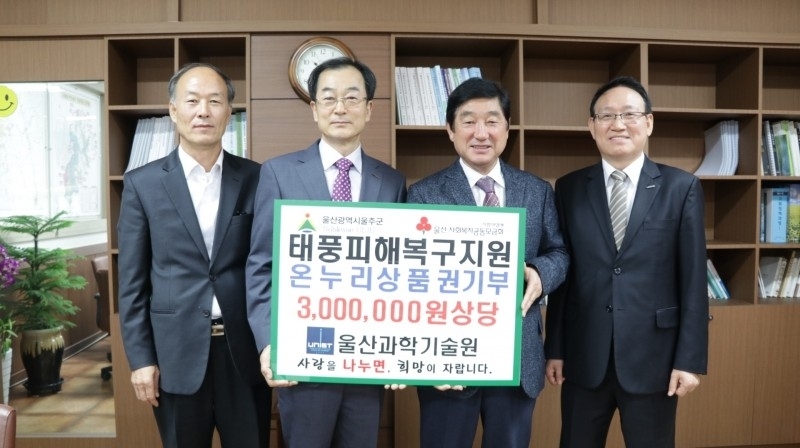 Kyoo-hwan Kim (Dean of Administration, UNIST), HanSeok Nam (Team leader, Office of General Affairs team, UNIST), Ulju County governor HanYeon Jang were among the attendees at the donation event, held at Ulju County Office in Ulsan. As part of disaster relieft efforts, UNIST donated 3 million won worth of Onnuri gift certificates to offer help and support to the local victims in Ulsan. This monetary donation was part of UNIST’s annual employee sporting event budget. Besides, UNIST students, staff and faculty have also delievered about $1,000 of donations to the Ulsan Community Chest of Korea on October 20, 2016 to offer help and support to the local victims in Ulsan. The funds raised will provide water, shelter kits, household living supplies and hygiene items for victims affected by Typhoon Chaba. “We hope our donation and the efforts of our staff will be a great help to the people who has been recently affected by Typhoon Chaba,” says Kyoo-hwan Kim (Dean of Administration, UNIST).